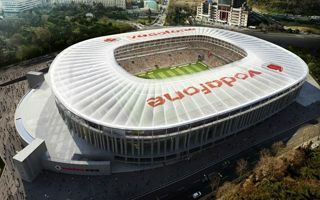 Istanbul: Beşiktaş to join richest clubs with Vodafone Arena? The recently published Football Money League report by Deloitte analysts includes two Turkish clubs, a number unbelievable two decades back. Galatasaray has been on the list for two years, Fenerbahçe followed suit first time this year. Both of the clubs benefitted from opening new stadiums. Though not private, the grounds helped boost revenue streams with extensive corporate facilities. Şükrü Saracoglu Stadyumu on the Asian side provided 132 skyboxes upon completion in 2006, becoming the single Turkish stadium with so many lodges. Galatasaray managed to beat that number in 2011, as their new Türk Telekom Arena had 157 skyboxes when opened. As if this wasn’t impressive enough, the club managed to sell licenses to all of them before opening and decided to add further suites, peaking at 211. Now Beşiktaş, the very last of Istanbul’s big three, want to join the race. Their 32,000-capacity old stadium is no more and a new one is underway. Because the plot is far too small to accommodate a stadium as big as those of derby rivals (50k+), the focus is on corporate facilities. There are 147 suites planned (up from initial 144). And though official sale hasn’t started yet, the club already managed to earn $850,000 from skybox licenses. The goal announced by BJK officials stands at $50-60 million from the lodges alone! This sum doesn’t include naming rights for the new stadium, already secured by telecom giants Vodafone in 2013. Though the stadium’s new stands are barely growing out of the ground so far, Vodafone bought the rights for one decade with possibility of extending the deal for further 5 years. Along with the 3+2 year deal for jersey sponsorship Vodafone pays $145 million, aiding ambitious plans of Beşiktaş.